Please click here if you are looking for tonight’s NBA lineups. Click here if you are a subscriber and need to log in. 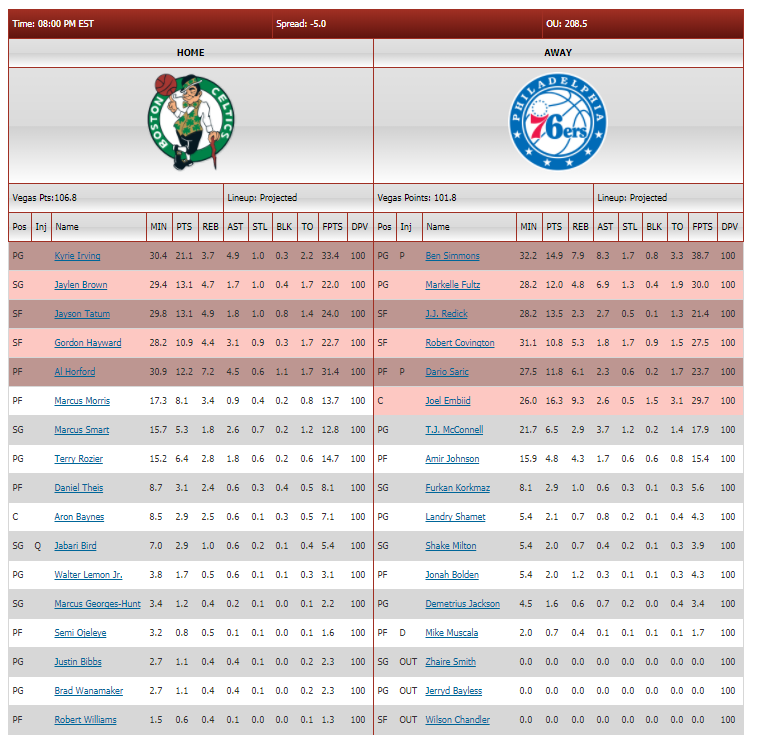 There are a number of sites selling NBA projections….so why purchase from Razzball? 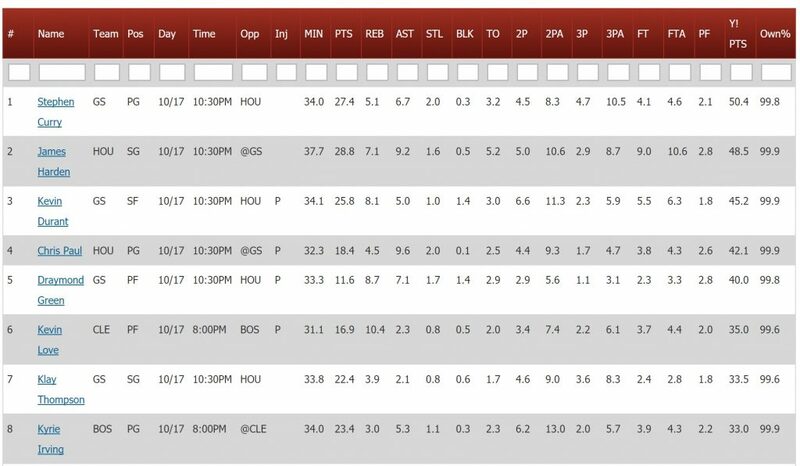 We feel the #1 reason you should get a premium fantasy basketball subscription is so someone mathier than you can crunch all the numbers, produce projections that give you an edge versus your competition, and display this data in easy-to-use fantasy basketball tools so you can make quick, informed decisions. That’s our strength. That’s our main focus. 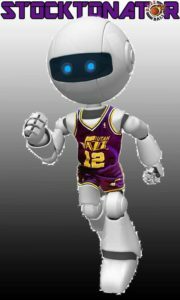 NBA Roto Deluxe (Season) $19.99 now. NBA DFS Projections (Monthly) $9.99 now. NBA DFS Premium (Monthly) $29.99 now. NBA DFS Premium (Season) $99.99 now. We call our daily projection ‘bot Stocktonator and he’s programmed to assist (motherf***in’ pun!) season-long and DFS fantasy basketball players all while wearing uncomfortably short shorts that only just conceal his ball bearings. Create ‘per 36 minute’ rate stats for each stat category using past performance backtested to determine proper weighting – e.g., yesterday’s game has higher weight than 80 games ago. We check player status/availability hourly from 6AM to 6PM EST and, from 6-7PM EST, we check every 5 minutes to determine players ruled ‘out’. Model likely starters based on active players and project player minutes using previous games and starter/bench role. Adjust/redistribute player minutes so that team minutes sum up to 240 + an OT adjustment (closer games more likely to go to OT). Replaced modeled starters with actual starters if the lineup has been posted. Adjust player rate stats based on opponent defense. Adjust player/team possessions based on team’s average possessions/game and opponent possessions/game. Adjust player rate stats based on deltas between Vegas projected team points and Stocktonator’s projected team points. Apply rate stats to projected minutes. Tiny adjustment to player points based on deltas between Stockonator’s team point projection and Vegas point projection. Our Roto Deluxe package provides daily projections for the next 7 days (today + 6 days), a 7-day average, and Rest of Season Game and Per 36 Minute averages. All the reports can be downloaded via CSV and have simple yet powerful sorting and filtering (e.g., type PG under Pos and it will only show PG, type G and it will show PG and SG, type >20 under PTS and >5 under AST and it will filter to only players projected for 20+ point, 5+ Assist games). In addition, we have a subscriber-only version of our NBA Lineups page which shows today’s projections for actual lineups when available and, otherwise, projected lineups. Our DFS Projections package includes downloadable DraftKings, FanDuel, and Yahoo projections as well as a DFS Points view of the starting lineups. Our DFS Premium package adds access to our Razzball NBA Lineup Optimizer powered by Daily Fantasy Cafe includes our projections for FanDuel, DraftKings, and Yahoo. Projections are updated hourly throughout the day and every 5 minutes from 5-7PM EST. Two different services are used to identify players who are ‘out’ and the system automatically redistributes minutes based on an algorithm that takes player positions, team style, and player roles into account. Adjust Player Exposure – Want to see a player in 50% of your lineups. Just set player exposure at 50%. Or you can set an exposure ceiling for a player if you like. Save Setting Profiles – Avoid having to make the same setting changes each time. Just save your settings. Save Lineups – Do you like to research early in the day and then revisit later in the day? You can save unlimited lineups. Download CSV – Download one or all your lineups for easy uploading to DraftKings & FanDuel. But why are you still reading? Just do a free 3-day trial and check it out in action. If you have any questions, ping our stat guy Rudy Gamble at [email protected] or @rudygamble on Twitter.